Agathis atropurpurea, first described by Bernard Patrick Matthew Hyland (born 1937), in 1978 is commonly known as Black kauri or Blue kauri. Description. Black kauri is and evergreen coniferous species of tree in the Araucariaceae family. 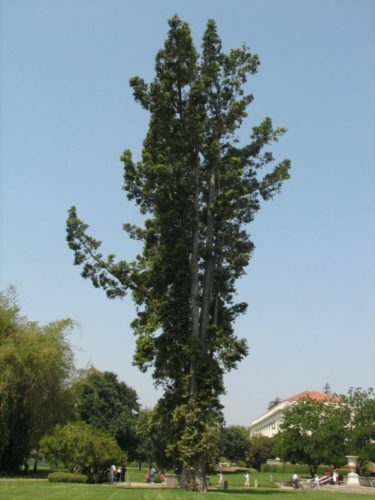 When allowed to grow into a large tree, it can reach heights of 165 feet (50 m) tall. The bark is brown with loose flakes and the tree can be confused with Bull Kauri (Agathis microstachya). Smaller trees however have a distinctive black, purple or navy Blue bark which is smoother and only slightly flaky. Resin oozes out from wounds in the trunk and branches. The leaves are lanceolate, 1.5 to 1.75 inches (37 - 45 mm) long and 0.32 to 0.55 inch (8 - 14 mm) wide, closely set, glaucous beneath, with a bluntly notched apex, a pointed tip and fine longitudinal veins. The pollen cones have a short stalk and are up to 1.2 inches (3 cm) long. 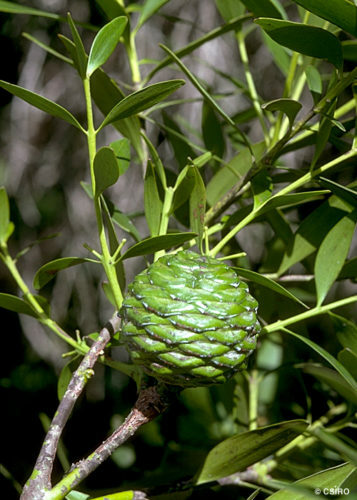 The seed cones are larger, 1.4 to 2.2 inches (35 - 55 mm) wide, green when young and have 90 to 150 scales. Distribution. This species is endemic to the coastal ranges of northeast Queensland. It is typically found growing in rain forests on mountain ridges composed of igneous rocks such as granite and rhyolite at elevations of 2,460 to 4,900 feet (750 -1,500 m) above sea level. Its range extends from Mount Pieter Botte south to Mount Bartle Frere. This forest is rich in vines, ferns, mosses and bryophytes. The Black Kauri is listed as being "Near Threatened" in the IUCN Red List of Threatened Species. In places where logging is allowed its numbers have declined but it is now protected in many parts of its range. One such place where it can be seen is the Wurunuru National Park. Agathis atropurpurea — foliage and seed cone detail. 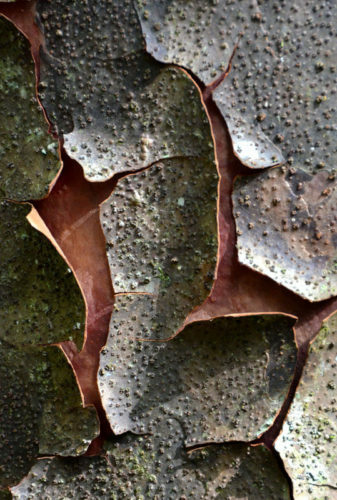 Agathis atropurpurea — bark detail. Agathis atropurpurea — a mature tree in a Queensland neighborhood.